Bottom line: Learn how to use the COUNTIF function instead of VLOOKUP to determine if a value exists in a list or range. Problem – I want to check and see if the names in column B exist in this long list of names in column E.
There are a lot of different ways we can solve this problem with formulas in Excel. You might be inclined to use a VLOOKUP formula, and that would work just fine. However, there are a few advantages to using the COUNTIF function instead. And less prone to errors. So let's learn how COUNTIF works. Here is a video from The Ultimate Lookup Formulas Course that explains how to use COUNTIF instead of VLOOKUP. *Double-click the video to watch full screen. This course has been designed to help you master Excel's most important functions and formulas in an easy step-by-step manner. COUNTIF is a very simple function. It's job is to search a range for a value and tell you how many cells match that value. In the example below I am using a COUNTIF function to return the number of times the word “Surf” exists in the range. The result is 3. Arguments: COUNTIF only has two arguments (Range, Criteria). Range – this is the range we want to search for the lookup value (Criteria). Criteria – this is the value we want to find. Rules: By default COUNTIF is going to look for an exact match of each cell's entire value. You can add wild cards and conditional/relational operators to the criteria to look for partial matches. Result: COUNTIF returns a numerical value for the number of cells that matched the criteria in the range. If the COUNTIF returns a number greater than or equal to 1, then that means the value exists in the list. If COUNTIF returns a zero then there are no cells that match the criteria. So back to our original problem, we can use COUNTIF to see how many times the names exist in the list. The cells in C2:C4 contain the COUNTIF function. When COUNTIF returns a zero (0) this means the value does not exist. So the result in cell C4 tells us that the name Bob Stevens does not exist in the list. Why Use COUNTIF Instead of VLOOKUP? When you just want to determine if a value exists in a list then I recommend using COUNTIF over VLOOKUP. It has a few advantages that make it more efficient, and also give you more insight to your data. The COUNTIF function only has two arguments making it really fast and easy to write the formula. VLOOKUP has four arguments. COUNTIF returns the total number of matching values in the range, so you can see if there is more than one matching value. VLOOKUP cannot do this, it only returns the first match. If the value does not exist, COUNTIF will return a zero (0). You do not need to worry about a formula error. With VLOOKUP, the formula would return an error and you would use and error handling function like IFERROR to handle the error. Checkout my article on VLOOKUP Explained at Starbucks if you want to learn more about how the function works. Here is an example of solving the same problem with COUNTIF vs VLOOKUP. The COUNTIF returns a number greater than or equal to 1 if the value exists in the list. It returns a zero if the value does not exist. The VLOOKUP formula is going to return the matching value from the list. VLOOKUP returns a #N/A error if it can't find the value in the list. Obviously the VLOOKUP formula is longer, more complex, and will take more time to write. The COUNTIF function has a big brother named COUNTIFS. This function allows you to specify multiple criteria in multiple ranges. You could use it to answer the question of how many Bob's are in the East region from the data set below. You can add up to 127 criteria! You can also use COUNTIFS with only one criteria, just like you do with COUNTIF. That means you could use COUNTIFS all the time instead of COUNTIF. I know a lot of people do this and that is perfectly fine. I wanted to keep it simple by explaining COUNTIF first. So now you know two new functions that you can use instead of VLOOKUP to find a matching value! This video and lesson are from The Ultimate Lookup Formulas Course. There are over 100 short videos just like the one above included in this self-paced online course. I’m trying to use =countif to identify a smaller set within a larger set, and be able to filter by it. Why I drag my copy/fill box down with my =countif formula, it is auto shifting the range down as well. I want the criteria to shift down, but not the range. HOw do I keep this from shifting? How we can use COUNTIF and VLOOKUP formula together? Just wondering if you got your answer and if you can share? From the example above, if a given price is b/n $0.00-$2.25 and I need value for Year 1, I need the function to return $40,500. I would greatly appreciate any input. In column 3 (last spreadsheet shown here) are pipe size. Last column is length of each pipe size. I’m looking for formula that will add length of each pipe size. There are multiple lines consisting of the same pipe size so I’m looking for vlookup, match index showing accumulative total in single cell below. Is there an easy way to get the cells that are a match on top of just their number? I need to know can I do to use the countif function using the vlookup to select different range with the same criteria, for instance: =countif(vlookup(A1,data,2,false),”X”). This way I will be able to count the same criteria in different range with the need to create a formula for each one of the ranges. I tried to do use it this way but it gives me an error, can you help me please, thanks in advance. Great question! You can use the INDEX function for this. INDEX will return an array and you can specify the column number you want to look at. The formula will look something like the following. The 1 represents the column number, which is the 1st column of the “data” range. If you changed that to 2 it would look in the 2nd column. You can also change the 1 to reference a cell that contains the number. Or you can use the MATCH function if you want to lookup the column header name to return the column number back to the INDEX function. 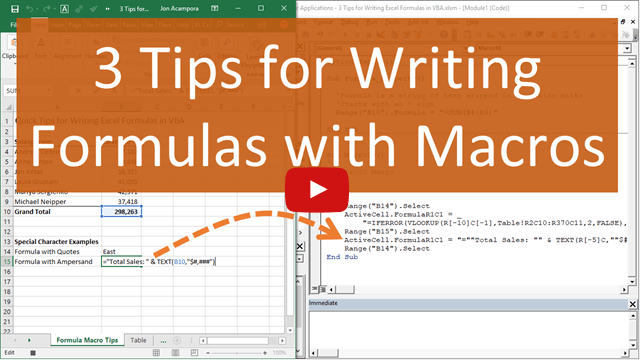 I also have a free video series on the lookup formulas that covers VLOOKUP, INDEX/MATCH, and more. Thanks Jon. That is helpful. Hi. In the past, it has always been necessary to ensure that the the two criteria ranges when using =COUNTIFS have to be of exactly the same number of rows. Is this still the case now? Yes that is still the case. Your criteria ranges will need to be the same number of rows or columns. They don’t necessarily need to start and end at the same row or column, but they do need to contain the same number of rows or columns. Let me know if you have any questions. Thanks! Is it possible to use COUNTIFS with the same range and just multi[le criteria? Great question Aimee. You can use COUNTIFS for multiple criteria in the same range, but it takes a few extra steps to make it work. There are basically two options. 1. You can use two separate COUNTIFS functions and add them together. =COUNTIFS(criteria1) + COUNTIFS(criteria2). This would count each criteria on the range individually then sum them up. Here is an article that explains both solutions in more detail. This is excellent. I will use COUNTIFS instead of COUNTIF and replace VLOOKUP wherever possible. Great help.